We keep hearing from web/tech gurus about how empowered artists are in the internet age, but yet, the numbers just don’t add up. It’s also ironic that tech bloggers like to promote the idea of “touring and t-shirts” as a solution to the difficulties musicians are having online. But it really sounds to us, more like an admission that there is no money for artists online in the Exploitation Economy to develop new and sustainable professional creative careers. “The Internet was supposed to be the ultimate leveler, great music would be able to find its audience, the ‘big label’ gatekeepers would no longer control access to the masses. It hasn’t exactly played out that way. According to my friend, Tommy Silverman/Tommy Boy Records and the co-founder of the New Music Seminar recently told me that he did the math and only 228 artists broke 10,000 units for the first time last year out of 105,000 albums. That’s 2.17% but only 15 of those did it without the help of a real label. That’s not very encouraging to the other ninety-eight percent. While tens of thousand of artists are self-releasing their music, their ability to get noticed in a meaningful way is stifled by the sheer volume of music that is arriving daily at iTunes, Amazon, Spotify, MySpace Music, Yahoo, Rhapsody, Pandora, iHeart and others. Ten years ago, there were roughly twenty-five thousand album releases a year. The numbers below are equally sobering. 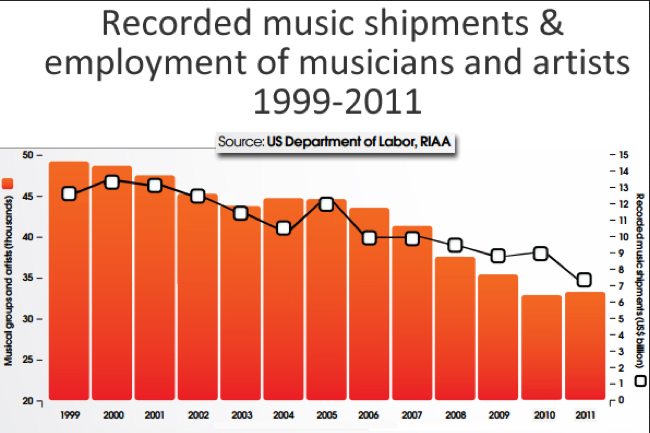 Not only did the volume of sales drop from 2009 to 2010, but also the number of new releases also dropped. Many promoting the exploitation of artists are also proposing that the new lower barriers for access to distribution will increase creative output, but that also appears to be false. Not only were fewer albums released, but the weakest sellers took up a smaller share of new release sales. The 60,000 titles that sold from 1 to 100 units represented 0.7% of all sales from titles released in 2010. In 2009, 0.9% of sales came from the 80,000 titles that sold from 1 to 100 units. So there were quite a few new albums that sold fewer than ten units. Put another way, the 60,000 new releases that sold 100 or fewer units averaged just 13.3 units per title. The statistics above do not support the assertion of the tech blogosphere that the internet has created more opportunities for professional creative careers, or expanded a working middle class of musicians. It’s actually very much so the opposite of their claim. It’s clear from the numbers above (and continued below) that the democratization of production and distribution has not democratized talent. The most exploited music, is not surprisingly, the most popular. These are the artists and titles which are also developed and promoted by traditional media outlets. Here’s another interesting stat reported by Digital Music News. Does this look like the empowerment of a new creative middle class to you? 99.875% – or nearly all – of Tunecore artists are making less than minimum wage through the platform, based on revenue figures recently shared by the company. Despite this fact, some tech bloggers can’t even understand how the simplest mechanisms function in the recorded music business. In an attempt to discredit some of the reports above one tech blog let lose with this gem below, alleging that because Tunecore and CDBaby releases are not reported directly to Soundscan their releases are not counted in Soundscan stats creating a massive unreported pool of revenue being ignored by the industry. TuneCore does not report results to Nielsen Soundscan and it puts out a hell of a lot of releases. Similarly, CDBaby/Disc Makers points out that Soundscan doesn’t count its releases either — which number around 50,000. The problem with the above is not understanding that Tunecore and CDBaby can’t report to Soundscan, because Soundscan collects the data from the point of sale such as Itunes, Amazon, etc. So in fact, all Tunecore and CDBaby releases and sales are actually cataloged and reported by Soundscan afterall. So much for all that unreported sales and revenue. All of this gave us pause when we saw a report given by The Future Of Music Coalition (FOMC) in Digital Music News that artists earnings are benefiting from digital technologies? How? As opposed to what? I can see that some digital technologies may be helping artists, but “overall” is simply, statistically, not true given the information above. So it trouble’s us to see statements like the one below made in public by the organization’s Kristin Thomson at SF Music Tech in February of 2012. Really? Maybe it’s not surprising that FOMC is also aligned with Public Knowledge who held a joint workshop to help musicians understand that, “Copyright law is changing rapidly in the face of new technologies.” The only problem is, copyright law is not actually “changing rapidly,” but it appears that Public Knowledge would like it too! Make no mistake about it, Public Knowledge is advocating for less artists rights and protections. So the real truth is this; if the internet is working for musicians, why aren’t more musicians working professionally?